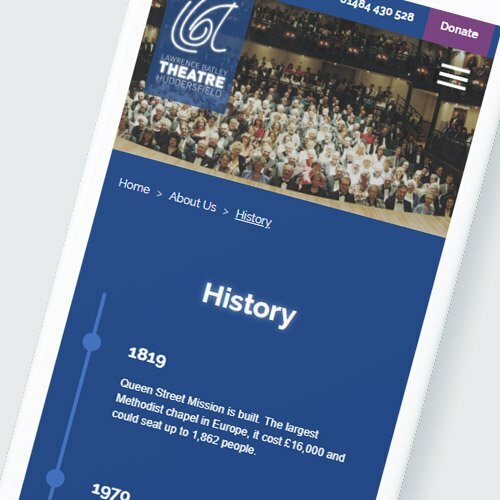 A new website brings the Huddersfield theatre’s digital presence right up to date, improving their clickthrough rate by 940% in the first month. The Lawrence Batley, also knows as The LBT for short, has been a cultural landmark for the town since Dame Judi Dench laid the foundation stone and Sir Patrick Stewart cut the ribbon in in 1994. The theatre’s programme is carefully crafted to serve the communities and artists of Huddersfield, Kirklees, and beyond. Walk through the doors of the LBT and you’ll find a thriving, modern theatre – but search for them online and you found an outdated website designed and built almost 10 years ago. It looked a bit bland, was hard to update, and more than a little bit clunky to use – especially on mobile. The LBT team needed something new, something that reflected their theatre, and the exciting programme they put on year after year – as well as more space to expand the information on their community outreach work with artists and young people. 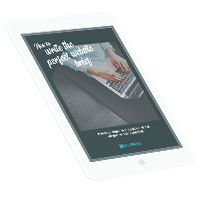 We worked closely with the LBT team to understand exactly what they wanted from their site, and they consistently gave us great feedback throughout the entire process to help us deliver everything they needed. The first step was to determine the new sitemap – while not remarkably different from the original site, it did need changing to highlight more of the theatre’s behind-the-scenes activities alongside the performance listings. 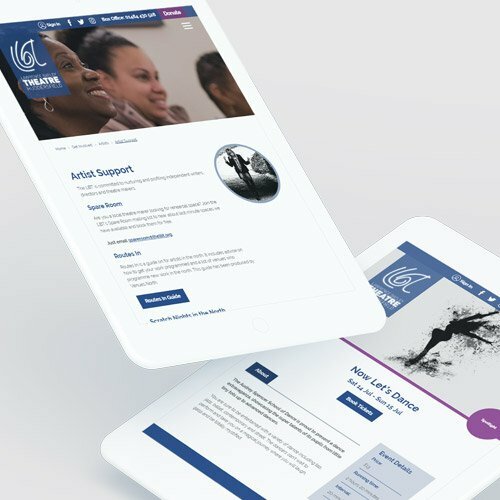 A new sitemap and menu structure made the site easier to navigate, bringing visitor information, donation call to actions, and artist development and community activities to the forefront. Two different website design concepts were developed. The first was based around a minimalist white theme, using icons colour coded to different sections of the site that would stand out and help people navigate through the various activities happening at the theatre. The second used a bolder, darker colour palette of blues and purples, with much larger images that really put the emphasis on the performances. A simple, clear menu directed users to other sections, with full-width banners for the most important areas the LBT team wished to highlight. The second design was taken forwards, resulting in a big, bold site with striking photos that really leap from the page. It looks great – particularly on mobile, where the chunky assets make the site very easy to navigate. For the most part, our usual custom WordPress build, with the bells, whistles, forms and highly customisable, modular CMS pagebuilder (described by Ruth at LBT as “a total gamechanger” – thanks Ruth!) that all of our sites will receive. However, we also needed to integrate the site with the theatre’s existing booking system (SRO), user account database and events calendar – which we did, adding the option to filter the listings by performance type (such as comedy, film, music, etc. ), as well as by date. Most importantly, it’s really easy for the LBT team to add and edit pages, and manage the site going forwards as they continue to develop their online presence. As they do grow the digital side of the LBT brand, we’ll be on hand to support them – as well as providing ongoing maintenance and management for the site. This was a great project to be a part of – the LBT is a big part of our hometown of Huddersfield, so we’re proud to have been able to make our mark. Splitpixel were excellent to work with from start to finish. We absolutely love our new website and they really made the process of booking tickets much easier for our customers. They understood exactly what was needed for our organisation and tailored their design and skills until we were 100% happy. I was really impressed.